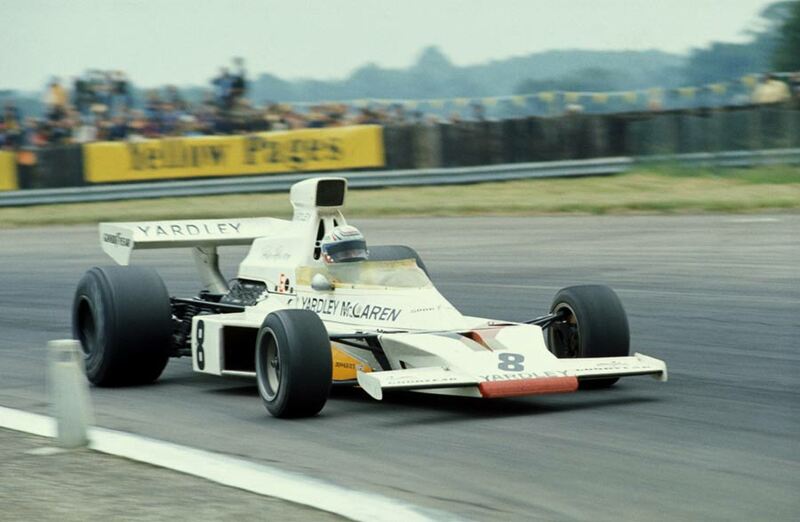 Peter Revson took his maiden grand prix win at Silverstone as his McLaren headed home a depleted field after a major accident caused a restart. French GP winner Ronnie Peterson took up where he left off, securing pole position for Lotus from the McLarens of Denny Hulme and Revson. When the race started, there was immediate drama when Niki Lauda suffered a driveshaft failure and was hit from behind by Jack Oliver's Shadow, eliminating both cars. Peterson led before Jackie Stewart eased passed him with Reutemann loitering in third. Jody Scheckter's McLaren lay fourth but as he powered through Woodcote Corner on the opening lap, the South African ran wide and spun across the track into the pit wall. He bounced back across the road and mayhem ensued as the pack tried to miss him. Jean-Pierre Beltiose (BRM), George Follmer (Shadow), Mike Hailwood (Surtees), Carlos pace (Surtees), and Jochen Mass (Surtees) were all involved as was the Brabham of Andrea de Adamich who suffered a broken ankle in the accident. It took 30 minutes to extract de Adamich from his car and a further hour elapsed before the race could be restarted and Lauda's repaired BRM was on the grid. The Austrian made a great start and climbed to second behind Peterson with Stewart third. The Scot moved up to second but spun on lap seven as a result of a gearbox problem and Lauda faded as he fell behind Revson, Hulme, James Hunt (March), Francois Cevert's and Reutemann. Fittipaldi was next out after 36 laps with a broken CV joint and that allowed Revson up to second and he started to close on Peterson. On lap 39 it happened, the American driver passing the Lotus and James Hunt also taking Hulme for third until his tyres faded and he slipped back behind the Kiwi.